Julia Fischer, Violin(Due to the MP3 format, there is some unavoidable distortion that occurs in the Julia Fischer recording)* If I were to present this complete program ‘live’ in a conventional recital hall, I would be tempted to add a theatrical touch: during the first Chaconne (Holland), the violinist who plays the final Chaconne (Bach) would sit on a chair (down-center) facing the side wall (stage left), showing their profile. The player would look straight ahead throughout, with hands folded in lap. 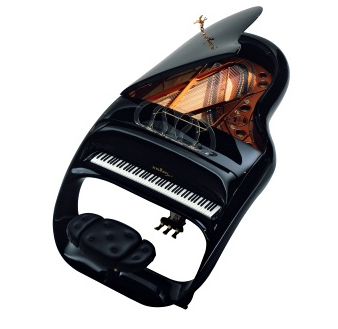 An open violin case containing the violin would be on display (perhaps on top of a piano bench) near the player. This entry was posted in Uncategorized and tagged avant garde music, chamber music series, classical music series, contemporary classical music, contemporary music, contemporary music series, music and the sublime, new music online chamber music series, online music series, the sublime in music. Bookmark the permalink.